Brand: Norpro N-5977 Units: 1 Dimensions: 2⅞" wide x 4¾" long x ¾" deep Instant digital readout, pre-settable alarm and magnet on back. Automatic alarm sounds when inner temperature is reached with a stainless steel 9" probe. Ideal for ovens, stoves, BBQ, and deep fryers. Complete instructions, temperature guide, and battery included. Temperature range, 140F-395F/60C-200C. Instant digital readout, pre-settable alarm and magnet on back. 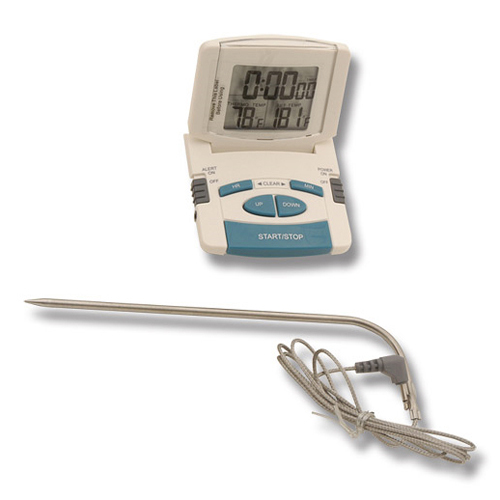 Automatic alarm sounds when inner temperature is reached with a stainless steel 9" probe. Ideal for ovens, stoves, BBQ, and deep fryers. Complete instructions, temperature guide, and battery included. Temperature range, 140F-395F/60C-200C.